Potted plants add a certain aesthetic value to homes and offices, bringing a touch of nature to indoor spaces. It has also been shown that many common house plants have the ability to remove volatile organic compounds—gases or vapors emitted by solids and liquids that may have adverse short- and long-term health effects on humans and animals—from indoor air. But take heed when considering adding some green to your environment; in addition to giving off healthy oxygen and sucking out harmful VOCs, a new study shows that some indoor plants actually release volatile organic compounds into the environment. 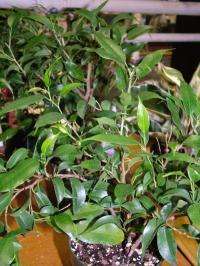 A research team headed by Stanley J. Kays of the University of Georgia's Department of Horticulture conducted a study to identify and measure the amounts of volatile organic compounds (VOCs) emitted by four popular indoor potted plant species. The study, published in the American Society for Horticultural Science journal HortScience, also noted the source of VOCs and differences in emission rates between day and night. The four plants used in the study were Peace Lily (Spathiphyllum wallisii Regel), Snake Plant (Sansevieria trifasciata Prain), Weeping Fig (Ficus benjamina L.), and Areca Palm (Chrysalidocarpus lutescens Wendl.). Samples of each plant were placed in glass containers with inlet ports connected to charcoal filters to supply purified air and outlet ports connected to traps where volatile emissions were measured. The results were compared to empty containers to verify the absence of contaminants. A total of 23 volatile compounds were found in Peace Lily, 16 in Areca Palm, 13 in Weeping Fig, and 12 in Snake Plant. Some of the VOCs are ingredients in pesticides applied to several species during the production phase. Other VOCs released did not come from the plant itself, but rather the micro-organisms living in the soil. "Although micro-organisms in the media have been shown to be important in the removal of volatile air pollutants, they also release volatiles into the atmosphere", Kays stated. Furthermore, 11 of the VOCs came from the plastic pots containing the plants. Several of these VOCs are known to negatively affect animals. Interestingly, VOC emission rates were higher during the day than at night in all of the species, and all classes of emissions were higher in the day than at night. The presence of light along with many other factors effect synthesis, which determines the rate of release. The study concluded that "while ornamental plants are known to remove certain VOCs, they also emit a variety of VOCs, some of which are known to be biologically active. The longevity of these compounds has not been adequately studied, and the impact of these compounds on humans is unknown."